One of the challenges of moving into a small space involves having enough storage for your belongings. While decluttering regularly helps, there are instances when we bring in new items or that we can’t let go of certain pieces. The owner of this 17sqm condo unit in Mandaluyong has a lot of things to deal with. “I moved [into the space] in 2012. This is not how it used to look like. I was the one who did the first design, but later on, it didn’t work anymore. I just had too many stuff, especially shoes and clothes that I use for my gigs as a professional events and TV host,” says Jazper, who also keeps a website/vlog up and running. 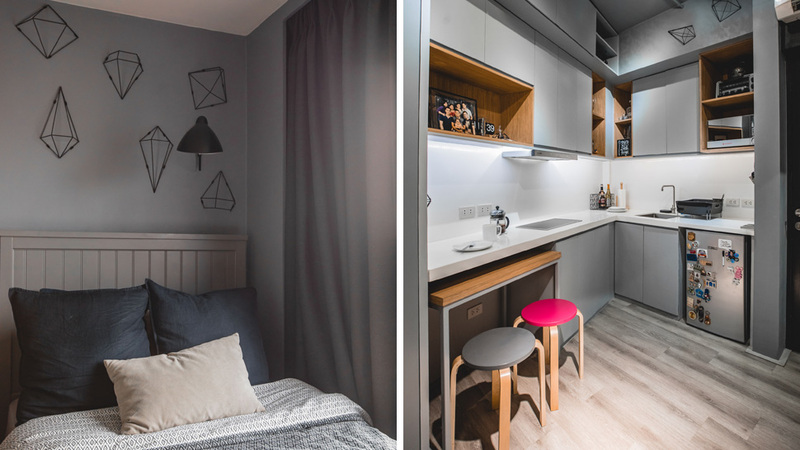 2016 proved to be a turning point for the homeowner as he decided to have the tiny space redesigned. To make sure that his vision and requirements for the unit are met, he worked with William Brothers Manila, professionals who specialize in design and construction, and interior designer Rod Lascano. With these experts on board, Jazper realized his dream for the unit. “[I learned] that your space could be more livable. With some adjustments and changes in design, it can suit your needs and taste better. You can actually make a small space a home that you’d want to go home to every day,” he shares.